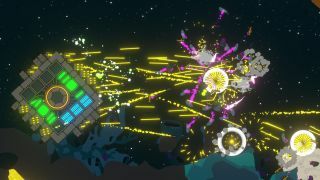 Nimbatus is a game about building spaceships that can mine planets and kill enemies. You assemble your vessel in blocks, making sure that you have enough fuel and batteries to power your guns and thrusters. My favourite so far isn't the planets, it's an arena where you face off against drones that other players have built. The catch is that your drone has to be entirely automated. By planting sensors and placing logic components in your chassis you can program your drone with basic behaviour. The second catch: no weapons. You have to shove your opponent out of a shrinking ring before a one minute time limit expires. The game has only just gone into Steam Early Access, so there aren't many players yet. That means I come face to face with my new nemesis. Its name is SUMO. When its forward sensor detects an enemy (me), the box boosts sideways, leaving my drone to gradually boost right past it and sail out of the arena. This will not stand. I take my drone, Autobox, Roll Out!, back to the drawing board. I know that SUMO will boost upwards as soon as I trigger its forward sensor, so I set up some lateral sensors and command them to activate side-boosters when they detect an opponent. This means as I start to sail past SUMO a sensor will detect it and thrusters will turn Autobox towards my opponent. It sort of works. Autobox turns into SUMO as anticipated, but then the two vessels lock up and start waltzing in circles. The borders of the arena shrink, and I can see that SUMO heavier, and more resilient. Autobox is pushed to the outside and shoved to another defeat. I need more power. I add a couple of short-burst side boosters and link them up to my short-range forward sensor (you can set sensor ranges with a slider). That means when I'm close to dead on with SUMO the extra boosters will fire and I should get a good forward shove. I return to the arena and this time it isn't SUMO. It's a completely unadorned bot called New Drone. Autobox, Roll Out! boosts forwards. The forward sensor detects New Drone and all of the thrusters light up, blasting my opponent out of the arena in just a few seconds. This is exactly the morale boost Autobox needed before the final showdown. I rearrange the chassis a bit to add even more thrusters and head back to the arena once more. SUMO is there waiting. Great job, Autobox. I'm sure I will build something much better when I get the hang of the game and unlock more gadgets, but for now, you are my prized champion.